The Whistler Museum tells Whistler’s stories from fun loving pioneers, to the creation of Whistler Blackcomb, to the 2010 Winter Olympic Games. A great indoor Whistler activity, the Whistler Museum is a fantastic option for a rainy day or a much needed rest-day from skiing! 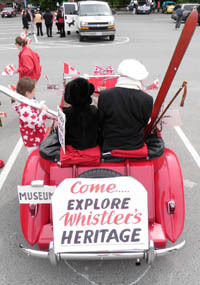 The Whistler Museum has kids activity books, a tickle trunk, and plenty of interactive exhibits – including the chance to take your photograph with a real Olympic torch. We also showcase natural history including information on Whistler's most famous non-human resident: black bears. Our by-donation entry fee means that this is a great choice if you are doing Whistler on a budget. We are open year-round from 11-5pm daily with extended hours every Thursday. Come and visit us and learn about Whistler’s journey from wilderness to world-class resort. We are located behind the Whistler Public Library, in the heart of Whistler Village. The Resort Municipality of Whistler is located in British Columbia, Canada. Whistler is part of the Coast Mountain Range, 120 km north of Vancouver. The drive is about 2 hours along the scenic Sea to Sky highway. Whistler first opened for skiing in 1966 as a small ski hill with one gondola, one chairlift, and two t-bars. Since that time Whistler has developed into a world-renowned resort, visited by more than two million tourists every year. The Whistler Museum tells the story of how a small, remote valley came to be one of the most famous tourist attractions in the world.